Last week I had the chance to catch up with Double Eagle Ryan Traeger, CEO and co-founder of ACHVR. Ryan received a BA from BC in 2003 and an MBA from the Carroll School in 2012. I have always believed that BC is a great place to start a business, yet our MBA program is not always viewed as such from the outside. One of the goals of the Grad Tech Club is to change that perception and create opportunities for plenty of future businesses to come out of the walls of Fulton Hall. Even before his MBA, Ryan was no stranger to entrepreneurship, running a small web design firm out of college before taking on some marketing agency firm jobs. While he loved marketing, Ryan started to feel the entrepreneurial itch again and decided to go back to BC for an MBA. He hoped in the time to either start something or find a fledgling business to join while there. In his first year, Ryan was a member of Professor Gallaugher’s TechTrek West class which he says was the pivotal experience in his MBA program. It really invigorated him and was the true impetus to making him really dig in and start exploring ideas with new vigor. The idea for ACHVR came to Ryan early in his second year and he ran with it. ACHVR would be an app that would gamify the experience of setting and pursuing life goals. It would also generate significant and valuable data for marketing and advertising uses. Passionate about pursuing the idea, Ryan approached the Dean of Graduate Programs and got permission for himself and a few others to approach the business as a class. He further developed the idea and then spent his second semester raising money. Ryan recruited a BC heavy management team tapping an undergrad classmate as CMO and a fellow MBA for the CFO. In October of 2013, ACHVR raised $1.3 million in seed funding! Clearly Ryan made great use of his time and skills at BC but was there anything he wishes he would have done more of? Of course! Ryan says he did not do enough going out to the slew of entrepreneurship events happening nearly every night in the Boston area. These events can sometimes be dominated by Harvard, MIT, and Northeastern and could certainly use an infusion of Maroon and Gold. In particular Ryan suggests the Drinks on Tap meetup for Mobile entrepreneurs and the Greenhorn Connect calendar for discovering other events. Thanks to Ryan for taking the time to talk and for his willingness to help out BC entrepreneurs! I look forward to chronicling more BC MBA startups over the next few weeks and to seeing more arise over the next few years! Interested in learning more about ACHVR? Check out this video interview conducted by BC’s own Greg Stoller. They come less often these days, but I still occasionally receive emails to the tune of “I’m not a coder, can I still join the BC Grad Tech Club?” I respond explaining that we are devoted to preparing our members for jobs in the Tech industry but that these include all disciplines including business development, finance, HR, marketing, and more. While professional clubs such as the Finance Club, the Consulting Club, and the Marketing Club seem to be pretty intuitive, our own is less apparent. While this ambiguity has allowed us to pursue a wide and meaningful agenda of activities, it has perhaps made it difficult to understand what it means to be a member. As a result, I thought I would share what one recent week looked like for me. It’s President’s day and a BC holiday. While there won’t be any classes today the Tech scene rolls on. I read my weekly email for VentureFizz, a great source of information about Boston Tech, looking carefully for any events our club members should attend or for jobs that might be a good fit. It would not be uncommon to have a speaking event on a normal Monday but today is a university holiday so I turn off my computer and head out to enjoy the day. 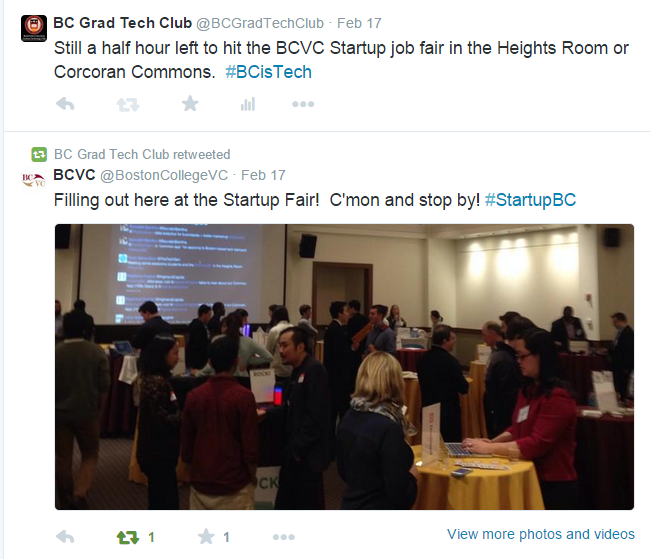 It’s snowing today but the BC Startup Job Fair has already been rescheduled once so we keep it as is. As I head to campus on a shuttle that promises a snail’s pace at best, I tweet a reminder to club members. In the startup world especially, it is all about networking as Bobby Gooch reminded us, and we need to mobilize our folks. I chat with early stage startups, later stage firms, and a slew of incubators and accelerators, at once looking for good fits personally and for opportunities to pass on to the club. There are a lot of good options and I exchange cards with a number of folks. I will need to follow up soon, but at present I can’t as I have to rush to Fulton Hall for a meeting. I slip into the conference room just as my watch hits 3:30. Google student Ambassador Arev Doursonian is already sitting there and we open up our computers to Google Adwords. This month’s Digital Marketing targets the popular SEM tool and we begin hypothesizing about the best ways to drive traffic to our site. The meeting lasts close to an hour and I leave knowing a lot more about the service than I did when I walked in. Hands on, experiential opportunities to test hypotheses and learn by doing. That is what this initiative is all about and a week later, we are making some serious progress. Nothing on the calendar today! Even with a lighter courseload this semester, days like this are rare and worth taking advantage of. I cross a number of items of the to do list, one of which is updating bcgradtechclub.net. I start with the events page but quickly move to the homepage. For such a dynamic organization it is pretty static and the image is a year out of date. I replace the image with one from our recent visit to Google Cambridge and then rename the page to “About” in our menu. I opt to replace the landing page with our blog to better represent the dynamic nature of our organization. We saw a lift from 1.7 pages per visitor to 2.4 after the change! Like all Wednesdays, I also send out the Grad Tech Weekly Update. This week’s emphasis? 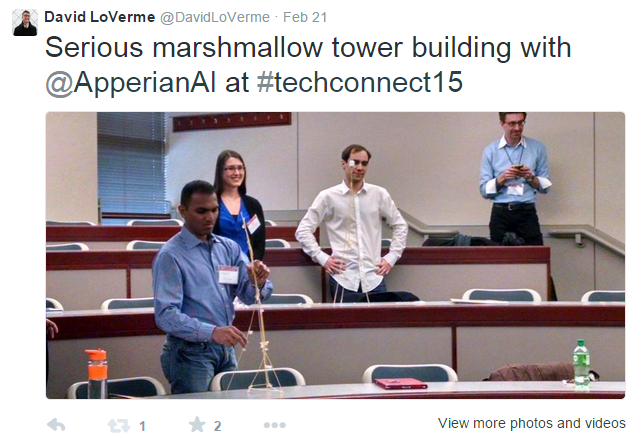 Code & Coffee, BU’s Tech Conference, and an opportunity to try out some Google wearables! It’s Thursday evening which means one thing, Product Team Meeting! This one is particularly special because we have been working for months to identify needs, develop concepts, and test our hypotheses. We finally have something we are ready to start working on and we have developers joining us for the first time! We take stock of where we are at and make a plan for the future. For me it’s off to class and then straight to Landsdowne Pub to support one of our members, Jackie Ouellet! In addition to being a full time MBA and an Uber driver, Jackie is running the Boston Marathon for charity. It’s great to see so many Eagles out to support her. Some even do so vocally…in the form of live band karaoke! It’s 12:50pm which means I am currently brewing a French press full of coffee to fuel us up while myself and others work our way through CodeAcademy’s intro to Python course. I blast Pandora “Don’t Stop Believing” Radio and crush lists and libraries. 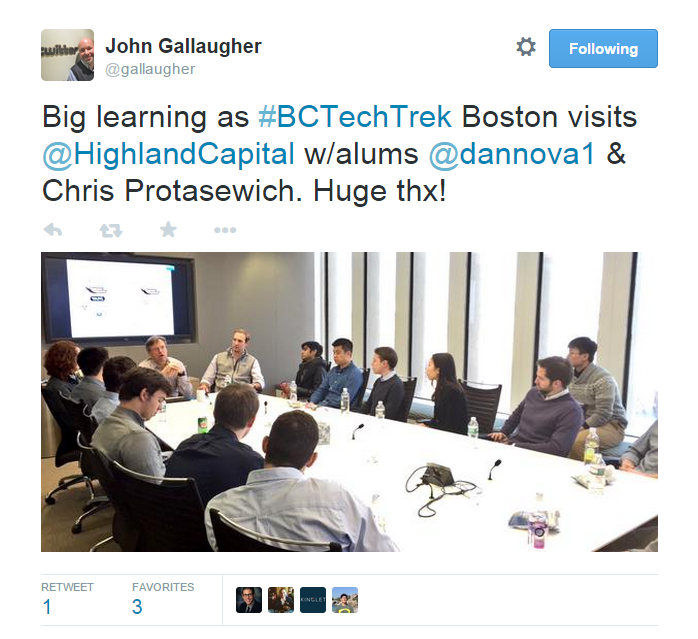 Normally our weekly Code & Coffee event lasts two hours but today I have to leave early to join a mixed group of MBAs and Undergrads at Highland Capital’s Cambridge office for TechTrek Boston. It’s an awesome event and I learn a ton! As you’ve probably come to expect…I blogged about it. As a second year MBA, I am used to evening classes. Maybe that’s why I am still groggy after being up for an hour and a half. I wait for the shuttle bus that has replaced the green line, pressed against a mountain of snow where once there was a sidewalk and crossing my fingers that I don’t get hit by the passing cars. Cold and traffic notwithstanding, however, it is going to be a great day! 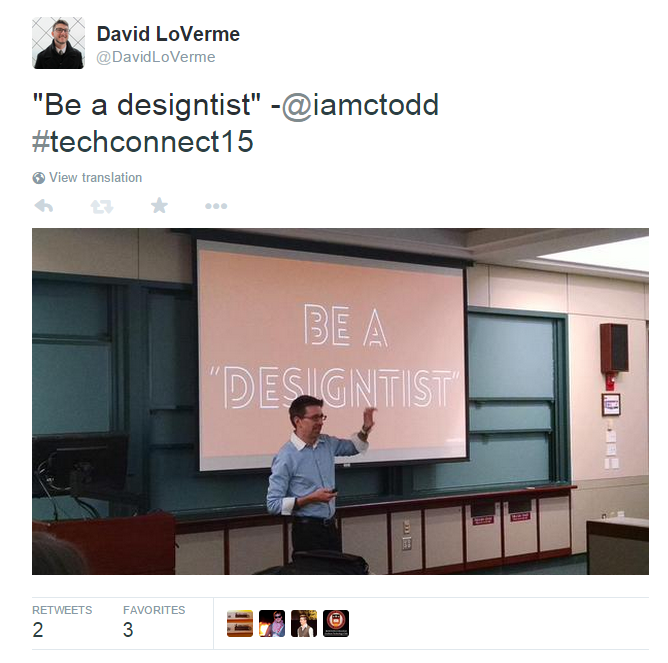 BU’s Tech Club is hosting their annual TechConnect conference and the theme is Product. I have worked with these guys before and seen many of the presenters speak in the past. I know it’s going to be a great event! Fast forward a few hours and I am enjoying a post conference beer and chatting with some of my Terrier counterparts. The conference was awesome and I learned a ton. I congratulate them on a job well done and fail twice at getting the green line shuttle to stop for me at Blanford St, I hail a cab and head home. I do nothing Tech Club related today…at least not that I can remember. We all need a day of rest after all. In an effort to drive traffic to bcgradtechclub.net and ultimately increase current- and future-MBAs’ user engagement with the site, we’ve begun pioneering our Google AdWords marketing campaign. While the campaign is still in its infancy, we’ve seen moderate success with the keywords we’ve chosen and returned today to reexamine the campaign. We found that the keywords driving the most traffic were “BCVC” (highest click-through rate), and “BC Tech”/”Boston College Tech” (tied for highest # of clicks). We also found that certain keywords, like “CSOM” and “Carroll School of Management,” had very low engagement, and Google even warned us that they were rarely shown due to low quality scores. Since an ad’s Quality Score is determined by its cost-per-click multiplied by its click-through-rate, we figured that we were getting beaten out by other CSOM advertisements and decided to eliminate those keywords. We also realized that it’s approaching the time of year that potential MBA students might be Googling MBA programs and Tech Clubs to get a better idea of the tech scene at different graduate schools. So, this week, we added keywords we thought MBA hopefuls would search– like “MBA blog,” “Business School Blog,” and “MBA life”. We’re excited to see whether these keywords increase engagement with our site during the rest of our AdWords Campaign. Feel free to let us know if you have any AdWords suggestions! We hope to keep up the progress in the future. Catching Up with the Product Team: Wireframes, Requirements, and MVPs…Oh My! When last we saw the Product Team, we were in the midst of testing various concepts to determine the right product direction. Since that time, we have made a lot of progress and we are excited to report that we are on track for an April release! After testing a few different concepts and determining market viability, we were left with three that we felt were worth pursuing. At this point, we weighed the various choices against the criteria of indication of interest, ease of implementation, requirements for outside help, time to impact, and cost. This helped us to determine which of the concepts made the most sense to pursue. The one that won out was a crowd-sourced and curated resource about sharing economy opportunities. The win was driven primarily by the fact that it would need little development effort as it could be done with WordPress and the majority of the effort was in content generation. However, since our primary purpose is learning and we like a challenge, we decided to go after our second choice concept instead. The ForgetMeNot concept is an app that uses RFID chips to track your items so you don’t leave without them. It will be the most complicated and require the most outside help to pull off but hey, we are nothing if not ambitious! As it received the highest score on market interest, we also felt we were justified in our efforts. Once we had decided on the concept we wanted to pursue, we began writing use cases and creating a MoSCoW list of Must Haves, Should Haves, Could Haves, and Won’t Haves. Before long, the list became pretty lengthy and we still lacked developer talent…yikes! Realizing that we were getting carried away, we reoriented ourselves to a Minimum Viable Product approach instead. Asking the question, what is the absolute smallest amount of effort and features we can create to make something that works well enough to start testing? Once we had that, we could see how users respond and adapt our roadmap from there. This produced a much smaller (and more manageable) list and we began writing requirements docs for the MVP and creating wireframes using myBalsamiq. For most of our members, this was their first exposure to wireframing, reinforcing our raison d’etre, to gain hands on skills and experience in product management! While many of us spend our Friday afternoons learning Python, we have not yet developed the coding chops to build this on our own. Operating on a shoestring budget, none of which can be used for direct compensation, we knew we had to find talent aligned with or primary goal of learning through experience. Using contacts made through a number of cohosted events with the undergrad tech groups we put out the word and received a few responses from some super impressive undergrad programmers. Luck was with us as the three students we have working with us each have a different core competency spanning Python, Java, and Objective C. These just happen to cover servers, Android, and iOS, giving us flexibility in what we can develop and release! More importantly, our new collaborators bring an excitement and great attitude that has provided a new spark of energy to our whole team! We cannot wait to get moving and get something awesome out there ASAP! As I write, we are working on getting our MVP planned and built so we can start testing with real users. One complication we ran into was sourcing the RFID strips. With a myriad of options, we are tapping expert resources to determine the right choice for our product. Concurrently, we are testing non-functional prototypes to determine the right look and feel of the actual tags. Exciting Stuff! 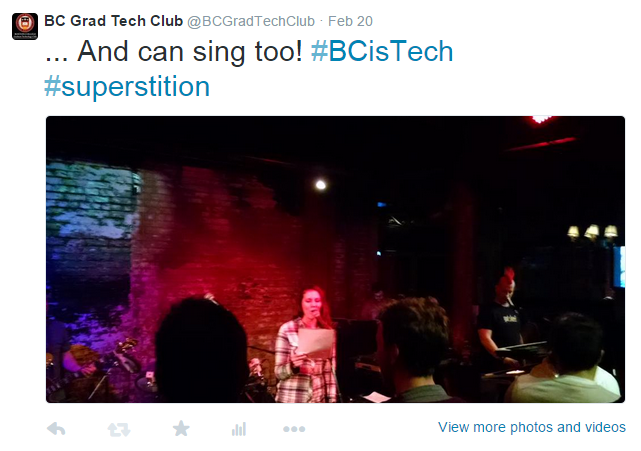 BC Visits BU for TechConnect 2015! Big props to our friends at BU for putting on an awesome TechConnect Conference this year! The theme was Digital Crossroads: Products and Ideas and featured an awesome array of speakers that really complemented each other and meshed with the conference theme. It is a ton of work to pull something like this off so my hat is off to Jaymie and her team for a job well done! A single post is not enough to do justice to the amazing amount I learned, but I’ll do my best to share a couple thoughts from each speaker I saw. Like Bruce, I have met Meghan a few times before. 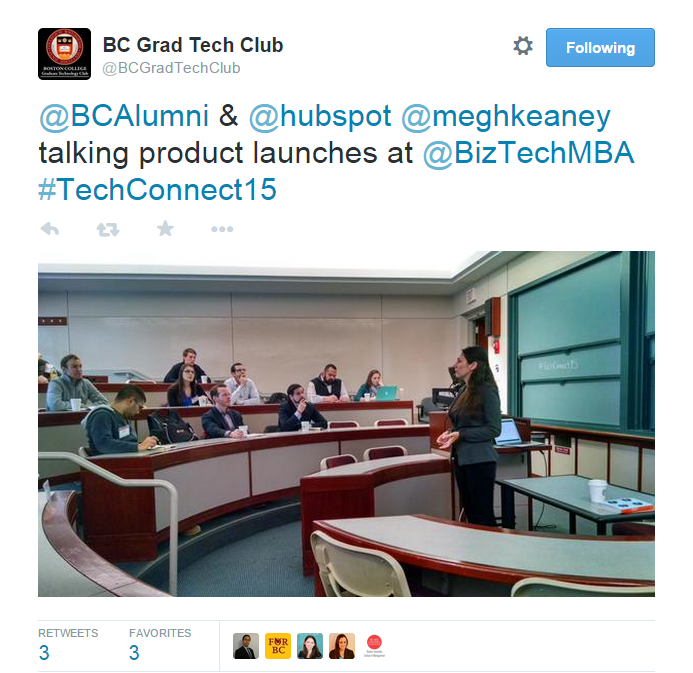 Not only is she Hubspot’s Director of Product Marketing, but she is also a BC Alum! Meghan combined her deck on product launches with real examples from Hubspot to demonstrate her points in a highly effective and meaningful way. She summarized the role of Product Marketing as coaxing the meaning out of the Product. She shared with us her Golden Rule of Product Marketing: It’s never about the product, it’s about the person using the product. The other thing I really liked about C. Todd’s presentation was the concept of Job Stories. We are all familiar with user stories and the amount of Jira tickets I have written stating “As a salesperson, I need to be able to…” could fill up more than a few Excel spreadsheets. Job stories are different in that they lend context to the request and are thus more powerful. They take the form “When (situation) happens, I want/need to (action), so I can (benefit).” This format forces you to think about whether you are really addressing the pain point and makes it hard for anyone to misinterpret intent. It’s not failure if you learn. Allen is an SVP at Mobile Device Management company Apperian and his session was perhaps the most fun all day, not only because he is charismatic and approachable and I learned a ton about small aircraft flight, but also because we did the marshmallow challenge. For those unfamiliar, it involves working in groups to form the tallest possible tower using spaghetti, tape, string, and a marshmallow on top. MBAs typically perform terribly at this, while kindergartners do much better because the task lends itself well to trial and error and iteration and not advanced planning giving the time limits and lack of expertise in most participants (architects as the exception do quite well when planning). Happily, we outperformed most MBAs and even kindergartners but learned that most of our assumptions were ill founded. Allen used the activity as a jumping off point to talk about effective teams and Agile product development. Diversity in Teams matters, need leadership, facilitation, and specialization. The crowning moment in your professional career is when you see your customers truly satisfied with something you have given them. Declaring work done is crucial to a successful scrum cycle. You are not working on a technology, you are working on a business problem. Must create dynamic on teams to want to improve. The final keynote of the day came from EMC SVP Dan Cobb who was slated to talk about creating a culture of innovation. To be honest, to me his talk was a bit of a let down. Dan spent the majority of the time educating the audience about EMC and essentially making a pitch for the company. 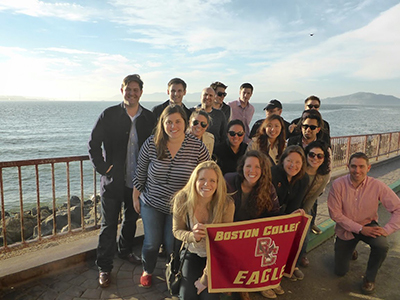 As a BC MBA, I am very familiar with EMC as they are a top recruiter on campus. Nonetheless, Dan did hit on some points that I found very interesting. When you aquihire you must empower the talent to stay on. EMC does this by involving its acquisitions in future M&A decisions. Develop a brutally candid view of the world. Institutionalize feedback loops and then step back to listen, partner, engage, and measure. EMC is “absolutely, positively, the most paranoid place in the world” and that is a good thing. Innovation is a strategic means to an end. I’ve been an Uber driver for about a month now. I’ve logged a total of 7.5 hours on the road, chauffeuring people around Boston and the burbs. About a quarter of the people I’ve driven around have asked me how I became an Uber driver and why I’m doing it. I tell them it’s for two reasons. The first reason is to help pad the wallet a bit while I readjust to living without an income. The second is for BC. I was lucky enough to be accepted to go on this year’s Tech Trek West, a field study to visit tech firms in Seattle and Silicon Valley (more to come on that experience in my next blog post.) One of the firms we’re visiting is Uber. I figured some inside insight wouldn’t hurt when we have the chance to talk to BC alumni during our time meeting with the company. I was also incredibly interested in how Uber got so popular, why it works the way it does, and some rider and driver pain points. Arguably the biggest pain point for riders is surge pricing. As an Economics major (BC ’09! ), I immediately liked the concept of surge pricing. Not that I’m willing to spend the money for 4x the normal fare, but it makes perfect economic sense. If you’re willing to pay for it, you should be able to get a ride across the city, even if you are paying top dollar. Many riders hate this, feeling as though they are being taken advantage of when they need a ride the most. Well as it turns out, Uber drivers are real people, too, and also would prefer to go out to dinner on a Friday night or be sleeping at 2 AM when the bars close. Surge pricing gets more drivers on the road when more people need rides. Simple economics, hence the appeal. On the driver side, my biggest frustration is that I’m not able to choose an area within which to drive. All drivers are at the whim of the riders – drivers aren’t actually shown the destination of the rider until the rider gets in the car and the driver swipes “start trip” or asks the rider, “where to?” This means if things go poorly, as a driver I could potentially end up in New Hampshire towards the end of the night, an hour or more away from home with no guarantee a request will come through for a ride back to Chestnut Hill. While there are a couple possible improvements in logistics, the ease of use is top-notch. The driver app, like the rider app, is incredibly intuitive and easy to use. 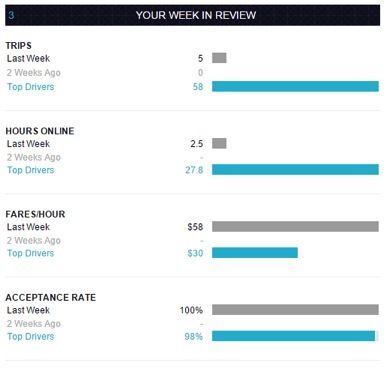 Uber certainly makes it easy for drivers to know how much money they’re making and how they compare against the top drivers out there. As you can see in the screenshot below, I’m making better money per hour than the top drivers (because I only drive during times of surge pricing), but I’m working fewer hours and taking many fewer trips. This dashboard makes it easy to see how I’m stacking up against other drivers and definitely provides an incentive to stay on top and keep driving. 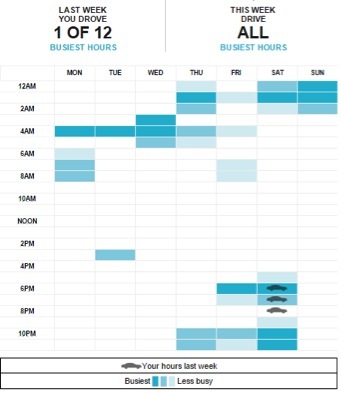 The screenshot below makes it easy for me to see when the busiest hours are and when I’m most likely to see surge pricing. This is mostly intuitive, but it’s nice to have a visual. It also makes me wonder why 4 AM Monday – Thursday is one of their busiest hours. Being involved with the company on a new level like this really got me spending a lot of time thinking about small tweaks they could make to the app to help alleviate rider and driver pain points. As I’m also involved with fundraising for the Dana-Farber Cancer Institute, it also made me wonder about opportunities to drive for charity. I’m sure there’s a segment of the population out there that has limited funds to donate to charities they’re passionate about, but has a car and time and would be willing to drive people around knowing the money earned would go directly to their favorite charity. All in all, it’s been a good experience so far. I’ve picked up other MBAs from both BU and Harvard and have even been able to do a bit of networking while driving people around. If nothing else, it’s great practice talking about any topic under the sun with a stranger. More to come on this in my next post! Reposted from the Carroll School Admissions Blog. Jackie Oullet is a first year MBA and member of the Grad Tech Product Team.